We have the good news from Hong Kong!!! At the beginning, It was not very smooth finish for Hang in the qualify rounds because some accident, otherwise Hang could TQ the race because his laptime is similar to Jilles Groskam and Ronald Volker. 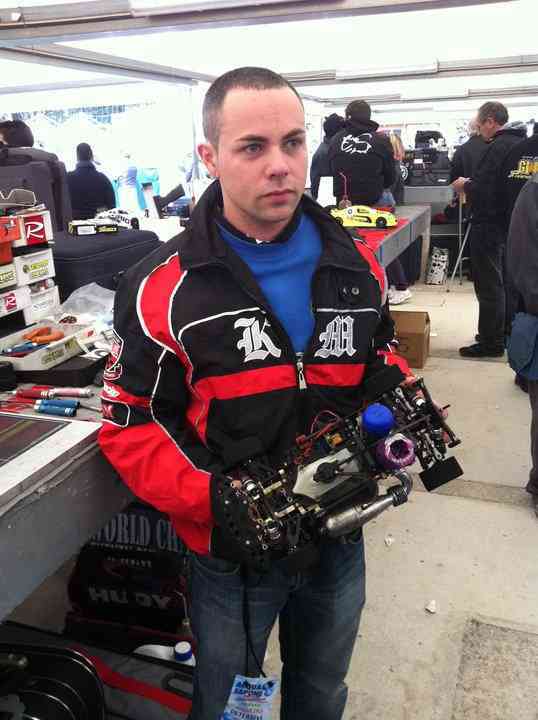 Finally Jilles took the TQ and Hang start on 3rd in the A Main final. When the A-final start, Hang was hitted immediately by another car and become the last position to chase up. But within one tank Hang came back rapidly form 10th position to 3rd, and after one refill he already past Ronald Volker and chasing Jilles. At 15 mins he past Jilles and took the lead, until the last mins Hang was still in the first postion but the MC announcement was very confusing that he thought he finished the last lap and won the race, but then the MC announced again they still need to finish the last lap, and at that moment Ronald Volker past him and took the champion title with only 0.18 sec. It was a little disappointment for him because Hang should have won the race without any problem. However it was still a aggressive result because he was testing the new side battery chassis version and feel that the handling was really really good!!! We KM are working on lots of new ideas and new parts for the coming new version. And we will release side battery chassis conversion set and lots of new option very soon. We have great news from Thailand! H-K1 Dominated X-ceed Cup and took all major titles!!! 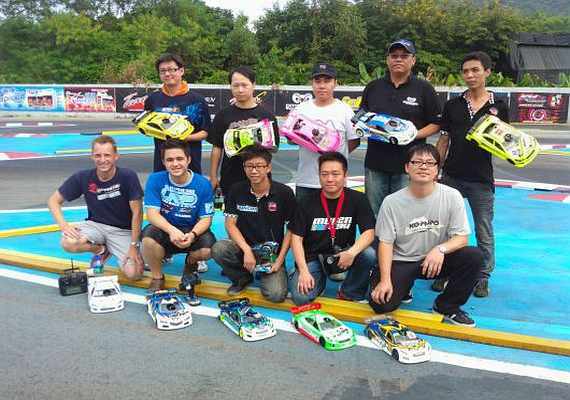 Again and again, Meen and Charlee proved that H-K1 is the most competitive racing car in RCAddict of Thailand!! Thanks again for Team KM thailand’s effort!!! Trust you are well. 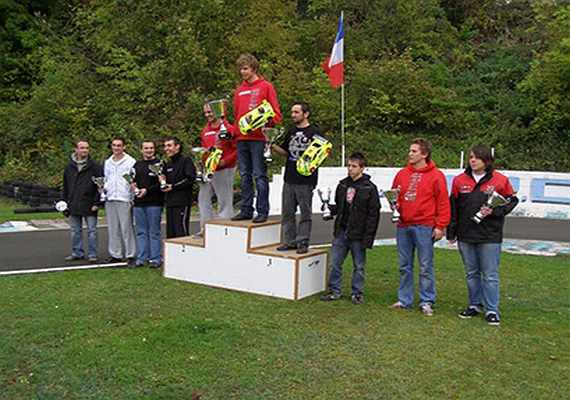 Last weekend was held the French Cup 2011 at Louviers track (North of France). 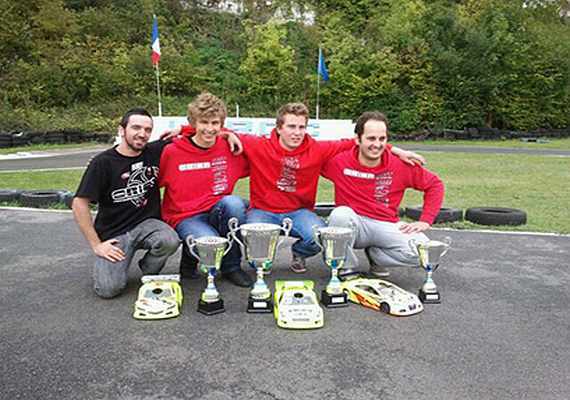 In qualification, Arthur Leclercq get the TQ honors with his Capricorn with Basile Concialdi (French Champion 2011) in second position with another Capricorn and in third position our new driver – Frederic Bourillon with his KM H-K1. He missed out the TQ honors while he was leading after a car pushed him out out during his fastest run. The young driver Léo Arnold get the victory after the 30-minutes final with his Team Orion powered Capricorn in front of Basile Concialdi (Capricorn/Orion) and Frederic Bourillon (KM H-K1/Orion) after a great battle between these 3 drivers. Frederic Bourillon was in great 2nd position and made a mistake in the pit-lane but managed to get the 3rd position. The car H-K1 was a real fast car and I made some testing with him in the past few weeks and he manages to get the car faster than his previous cars !! 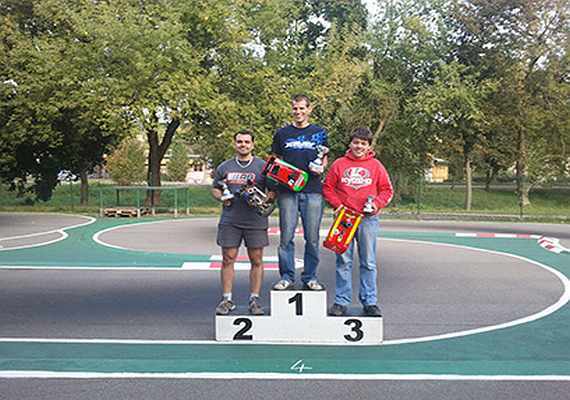 Double win and 1st title for KM! We have Total three victories last weekend in three different countries—Japan,Brazil and Czech Republic!!! 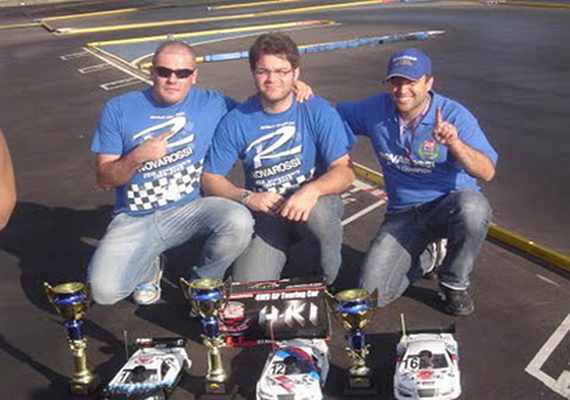 KM H-K1 dominated the 6 th round of Santo André championship! Not enough, with one round to go Sandro Martines is already champion in Expert class after winning the race ahead of Serpent driver (with KM transmission!) Fabricio Zamperetti and KM driver Anderson Becheli, who is racing in expert class to gain experience, in 3rd. In Sportsman class Anderson had a mix of bad and good luck. In the middle of the race an incident caused made the side belt come loose. Anderson lost about 2 laps to get the belt replaced and was cruising to finosh on 2nd place when with 3 minutes to go the race leader had a carburettor problem and left the race. Also drivin g a KM chassi, Geandre Rollin took advantage and finished 2nd a few seconds behind Anderson, so we had a 1-2 for KM! Good news from Czech Republic! H-K1 took 2nd place in 2011 KWC!!! 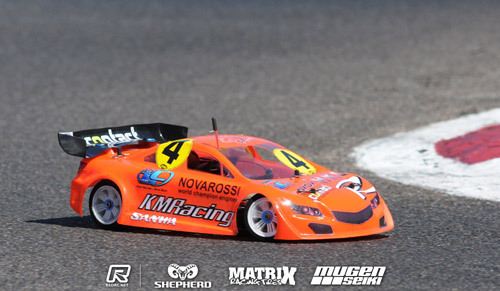 In saturday(17.9.2011) was the last race KWC(Kyosho world cup). My first ride and race with the chassis H-K1. After qualifying I was the second. 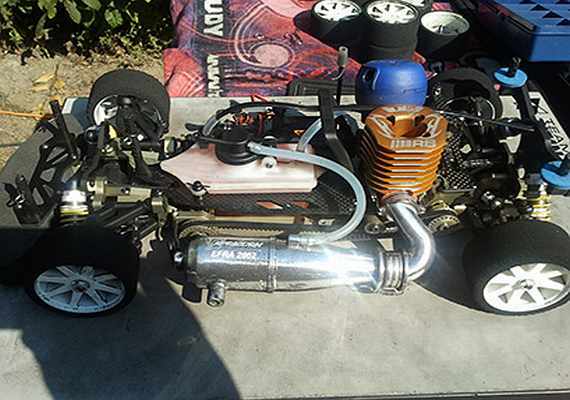 The chassis functioned perfectly from the start. No technically problem. 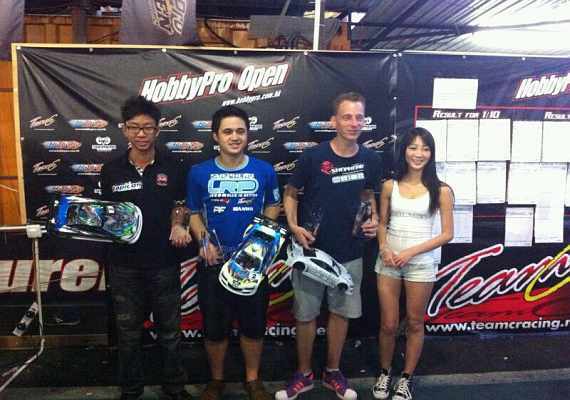 After the final, I finished second. 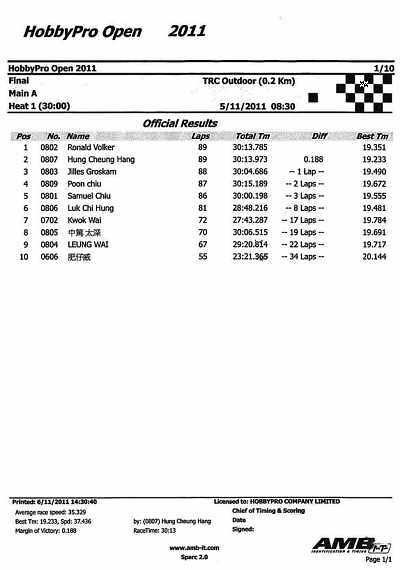 Good race for me and good experience with the chassis H-K1. >We have the good news from 2011 European Championship,first time for H-K1 in European Championship and Dario made the A-Main finalist and stand up 7th!! It was a really hard battle that there are so many very fast germany drivers in their home track.In A Final Dario stay in 4th position for very long time and went up to 3rd before his receiver had probelm with the plub came out and he lost 8~10 laps from there. 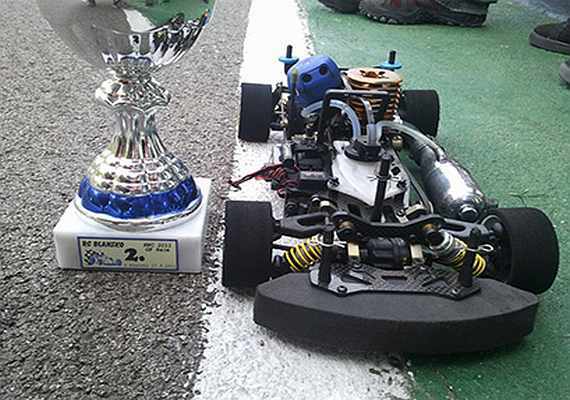 But Dario prove that H-K1 has the ability to fight with them and putting H-K1 in Top 10 even Mugen is only one car there.Other famous brands like Kyosho,Serpent,Capricorn…even home home track for Sheperd couldn’t be there…so We would like to thank him again for the great effort!!! Hi! 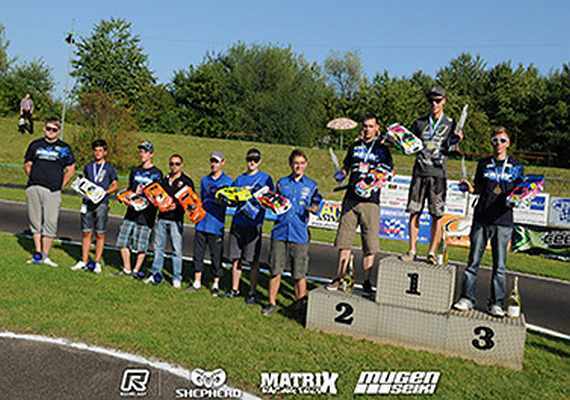 I returned yesterday night from european championship..I did my best to be able to enter into final.. at the end of final i had a problem with the receiver and i stop for 8~10 laps..if not I would still have chance been stay on or better than third place..
i think that for KM the final of european championship is a important result for now,and this is the first important race for me with H-K1, and i work all effort for arrive in final, BUT MY COMING TARGET IS WIN. However, for me is important to do a great job to go with KM in the final of EUROPEAN CHAMPIONSIP this time! 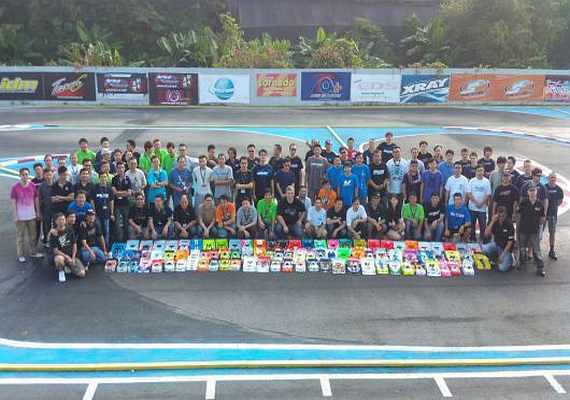 The next coming important races for KM is next month’s JMRCA All Japan National Championship,then Oct is the Italian national Championship and in Nov is the World Championship Warm-up race in Thailand. 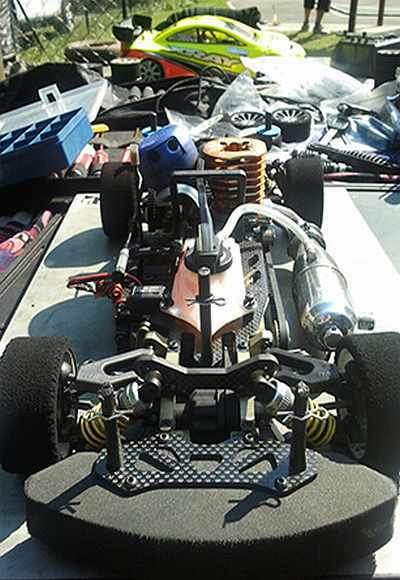 We KM are working very hard and very quickly for any possible improvement of the car and sufficient new parts to make the H-K1 even better and faster in the shortest coming days,and our final goal will be the 2012 IFMAR World Championship Title!! 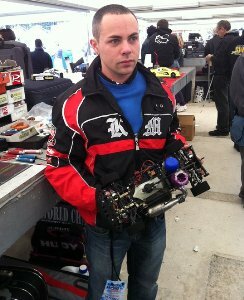 Dario Fly With KM H-K1 In Novarossi Trophy Italy!!! Almost every weekend we have the great news for KM H-K1! i just returned to home now and i want to inform you that i win novarossi trophy! New record of yhe fiorano track with 1/10, record on 7 minuts on qualify and win the final with 3 laps on the second. in the file the chrono of the race. in weeks i send you a complete report of the car and set up. very very goooood car! I’m very happy to drive this car.. Thanks for Dario and congratulation to his second victory for KM! We are very sure he will continuly to take a lots more big titles for KM! !